Crab is well suited to throw on a smoker with its hearty shell that acts like a natural aluminum foil. The shell will keep the crab from sticking to your grill grates. If you have the option to buy king crab over snow crab we recommend the king crab due to its larger size. Any time you throw seafood or meat on a smoker you typically want a larger cut to allow it to stay on longer and absorb the smoky flavor of the wood. 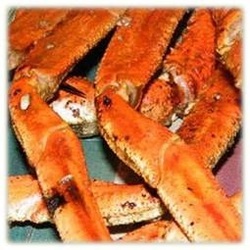 Smoked Crab Legs - Though you wouldn't typically think of crab legs as something to throw on your smoker, smoking crab legs actually imparts a flavor that you just can't achieve with the standard steam or boiling methods.